You are here: Home / Review / SignMYi Review! What is SignMYi? Only one of the coolest apps out there!!! One of the coolest parts of our Disneyland trip!! Alice was able to meet her favorite characters and have those same characters sign a PICTURE of them together!! 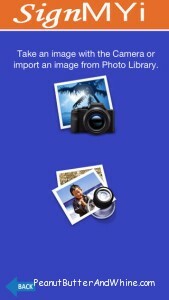 First either take a picture from the app itself OR from your photo library. Then you can change the color of the signature ‘ink’ from black, white, blue, red, silver, orange. From experience blue really POPS on the photo’s. You can also select the line width. from one to 20. 10 worked best for us. Don’t like the signature? Sweep away the entire signature or erase just portions of the signature. This is the COOLEST APP!!!!!!!!!!!!!!!! 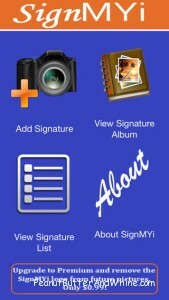 SignMYi works with the iPad, just snap a picture of well, ANYONE that you want an autograph of! Be it Disney character or sport personality, this is perfect for anyone you want an autograph from!! Snap the picture then hold the iPad out with a stylus pen for the autograph. Disneyland is totally the perfect place for this app!! Not only was it cheaper than the autograph books that Disney sells!! BUT, I have pictures of Alice AND her favorite characters together!! AND autographed!! I have to say when it’s really crowded you have to be fast!! So some of the pictures were not the best, but Alice is thrilled and really, that is all that counts!! 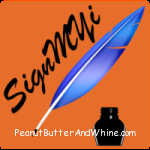 SignMYi is optimized for iPad and you can use your finger or a stylus pen. Not only do I have an autographed copy of Disney Characters that I can print out and cherish, but, I can immediately share via email, Twitter and Facebook!! Follow SignMYi on Facebook and Twitter Grab your SignMYi on iTunes! Alice and I give SignMYi FOUR thumbs WAYYYY UP!!! Disclosure: I have received complimentary/free products for the purpose of this review. The opinions are 100% mine. I have not been influenced in any way. I am disclosing this in accordance with Federal Trade Commissions 16 CFR, Part 255 Guides Concerning the use of Endorsements and Testimonials In Advertising. Connie at Peanut Butter And Whine. We have used this app on our vacation to Disney World and it’s awesome. We took out ipad-it wasn’t a problem at all-and a stylus pen. We didn’t feel rushed, it was easy for the characters to use. I highly recomend it. I’m a big picture person and I was able to print out an awesome coffee table book through Shutterly that has each picture with the autograph-so much better then the autograph books you have to buy! I bet Alice really likes this. I don’t have the technology for it, but looks like a fun app. Aw how adorable, Alice is just as cute as a button. Love the photos. Enjoy every minute you have with her my friend. Monthly Cash or GC G!veAway! $35 Paypal? 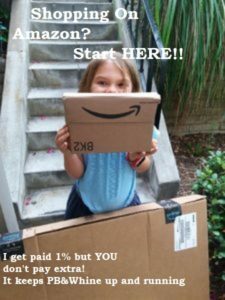 Walmart, Target, Amazon, Home Depot GC?